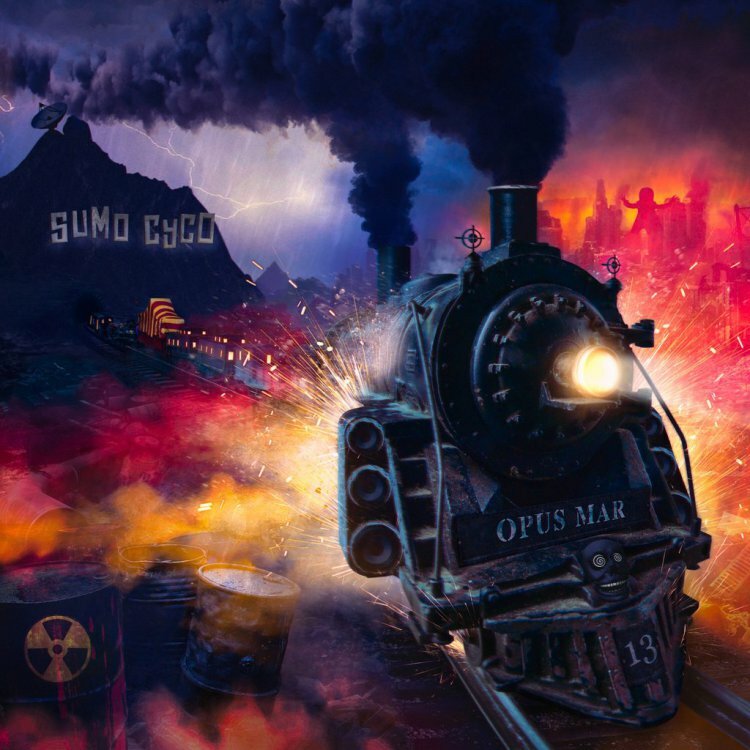 Sumo Cyco released their second album, Opus Mar, on March 31st, 2017. It’s quite minimal, but some of the choruses do take you back to the sound that got you a JUNO nomination all those years ago. Of course the new music is completely different, but would you say there’s still a bit of that younger you inside of your music? Of course. I get it all the time, a lot of people online will be like “we want the old Skye back,” or “when are you going back to the real you?” (laughs) Stuff like that. Honestly, I don’t think it comes from a place of them trying to be mean, they probably just grew up with some of my music and have a strong feeling of nostalgia and wanting more of that pop feeling that happened. But I think it also has something to do with the fact that I told everyone that I had this sort of alter ego when I started Sumo Cyco and I think that plays into the fact that they think the real Skye Sweetnam is still locked up in some cage somewhere that Sever has taken over and I’m going to eventually let the other side of me out. But this is really who I am and who that young girl evolved into and I do think that there are parts of me… I’ll catch myself all the time when I’m writing and most recently when we were writing a recent song, one of the jobs of my guitarist and co writer is to tell me when something is too young or too cheesy. It’s really instinctual for me to go to the most poppy thing I can think of and it’s my own brain that has to pull myself back and go “how do I take this from the most obvious pop thing, to being way more interesting?” Then I’ll use my sounding board, Matt is kind of my sounding board, to go is this too hooky and in your face pop, or does this have that cool element to it that takes it away from feeling like it’s just in your face here’s the hook. We always try to find that great hooky, so people can sing along and get into the song, but also that has a lot of meaning and more of a cool underground feel as well, so it doesn’t feel blatantly poppy. Sometimes I’ll catch myself doing that; sometimes I’ll go off on the deep end and do really obscure, strange things. That’s why it’s really good to have other members in our band and the way that we work though all of our songs. It’s really good to have a sounding board like that. Yeah, definitely. I think it’s really important a lot of the time, because it’s a very different dynamic, working with a band. If you were to, how would you compare working with a group of such talented musicians, to how you came up with your solo work? It’s actually not too different, just because of the fact that I always wrote songs, ever since I was young, it was not really in the typical way. [Not] sitting down with an acoustic, or the piano and writing a whole song with someone, then bringing it to the studio and recording it and turning it into more of a production. I’ve always written songs with people who were producer extraordinaires to begin with, so [when] you start off with someone who’s super talented at programming music into the laptop, it sounds almost like it’s a finished track and most of the time that becomes a finished track. You may re record the vocals, or re record the guitar, but what the song sounds like is pretty much how you start with it. So Matt, our guitarist and co-producer, co-writer, has our home studio that we work out of. He does everything. He just does everything. Programs the drums, he can play guitar, he can play bass, everything. It was the same kind of way when I did pop songs. When I was really young I worked with a producer named James Robertson and him and I did pretty much the exact same thing that Matt and I do. He was a musician extraordinaire, knew how to play everything and we would just sit there and work out the track. I’d do all of the top lines and vocals and everything over top of that, then work through the ideas at the end with them. It’s funny to me, because a lot of bands will book their studio time, whether it’s a few weeks or a month, and everything that they write and produce has to be done within that time that they’ve booked a nice studio. To me that’s such a foreign way to work, is to try to fit everything in such a short amount of time. I’m so used to being able to call up a buddy and be like “hey, let’s go into the studio today, I’m feeling inspired,” or if we’re not feeling inspired we take a break and go get some coffee. It doesn’t all need to be done in such a short amount of time. We take days, or weeks, or months in between writing sessions and get together when the moment strikes. That’s the way I’ve always written, so it seems weird to me when people say they’re going into the studio for a month to finish the record. That’s crazy to me. What kind of influence do you think your early career had on what you’re doing now, in all aspects from creation, to production, to performing? The main thing is having so much experience being on stage, having worked so many different types of venues and crowds. One of the main things that’s really great for me is the fact that I’ve been able to have so many years to perfect my craft, of performing and getting into the studio. I’ve worked with so many different people in the studio as well, so I’m really good at picking up on different techniques, the way that different people like to work when working with different producers or writers. Everyone has a different way that they describe sound, so going through a lot of different experiences has gotten me used to feeling out what different people mean when they describe what they want to hear or a way they want my voice to come out. [It’s] the same thing with performing in front of so many different crowds, from lame crowds to really exciting crowds, how to work all aspects of the stage and make things… when I get up on stage it becomes second nature because I’ve done it so much that I don’t really have to think too much, which is great. (laughs) I don’t get too much stage fright. I get really excited, but I don’t get nervous, I’m always super pumped and I think that’s from feeling like I’ve been doing this my whole life. It comes very naturally. There’s not that much difference when it comes to making sure someone is entertained when they come to a show than what I’ve been doing my whole life. I really enjoy rock and metal crowds, just because I feel like a lot of them are super engaged. They don’t have their cellphones out all the time, they’re really into rocking out and moshing. I love stage diving into the crowd, that’s [something that’s] a lot of fun that I didn’t get to do when I was younger. It’s a really great sense of looking to your left and looking to your right and knowing that person is going to pick you up if you fall, I love that. What’s the backstory to the alter ego ‘Sever’? Is there a grandiose story behind it, or was it simply an attempt to stray away from the teenage sweetheart persona? When we started the band, I slowly created this alternate universe called Cyco City, which is where all of our music videos take place. I thought naturally it would feel cool to have nicknames for each member of the band, so we all came up with… well I came up with (laughs) the name for them. Sever, the name definitely came from severing one persona from the other and I had a few videos online where my character Sever actually kidnapped myself, Skye, and put this story going where she’s up in the attic. I wanted to create… I had a lot of great following online and on youtube, even the years after my major label career died down, I still did a lot of online youtube videos, make up tutorials, and behind the scenes things. I wanted to ramp up the release of doing this band in a special way, so we had this almost take over idea, that the band was taking over Skye Sweetnam. I know I’m referring to myself as myself (laughs). Taking over me, as this big force. We had all of these graphics of a sumo wrestler covering the sunshine that once was the Skye persona and then Sever came and kindapped her. (laughs) It all tied into this fantastical world that we created with Cyco City. It’s a lot of fun, all of our fans can really get into it and some of them do. They’ll show up with their outfits from different characters and they’ve been involved in competitions where they’ve created a character sketch for someone that would live in Cyco City and we’ve integrated that into our music videos. I really am a big fan of the geeky side of me, these alternate worlds. Everything these days from Harry Potter, to Marvel, to Lord of the Rings, all of these worlds that you feel are an alternate dimension where anything goes and we can create storylines within that place and I really love that. It’s the total geeky side of me that’s into fantasy. I love the film aspect, to be able to have all of these interesting connections between our music videos, where you’re like “oh my gosh, that’s the character from that video.” We have all of these hidden puzzle pieces for the people who have watched all of our music videos. It tells a bit of a larger narrative from the Cyco City place. Which I’m sure, like you said, you like to read your fan mail and I’m sure there’s a few if not many dedicated fans that have picked up on that. Yeah, for sure. It’s pretty cool. It’s ever expanding, ever growing and I’d like to do more and more work in that film world, where we tell more stories. We still have yet to finish… our first record, Lost In Cyco City, we did a video for almost every single song on the record and we were intending to finish up that story, but we got a lot of pressure from our producer because we were going on more tours and we needed more music. Our managers and everything were like “okay you guys, we’ve got to move on. You’ve done like ten videos already.” So we still intend on tying that up in a nice bow and segueing that into the Opus Mar storyline that we’ve created. It’s about this train, Opus Mar. We’ve decided to do a bit of a scale back, because the videos were taking up so much of our time. So instead of doing these full story pieces for each song, for Opus Mar we’ve basically made every single video based around this train called the Opus Mar and we’re going to eventually tie it in. I know that there have been some people like “hey, what’s going to happen? You left us on a cliffhanger at the end of the chapter.” We’ll finish it up, don’t worry.